Hand, foot, & mouth disease is a common contagious viral illness therefore antibiotics are not necessary. It typically affects infants and young children under 5, but older kids and adults can get it as well. 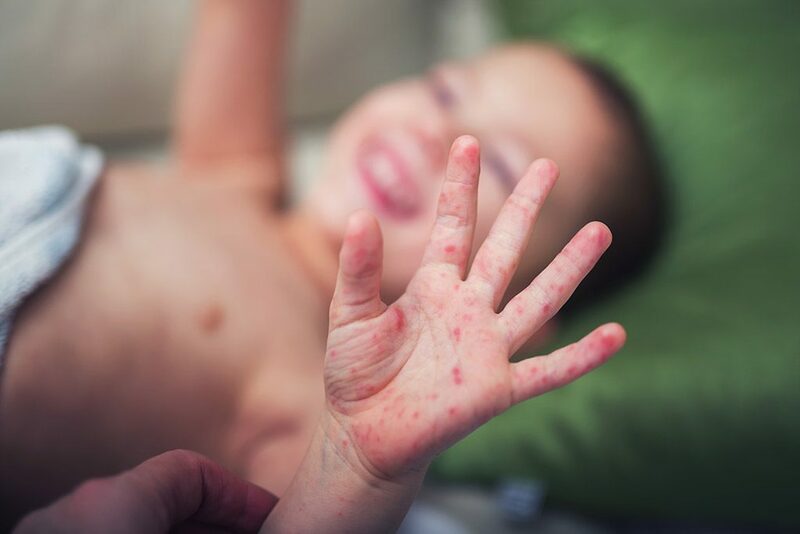 Symptoms often present initially like the common cold such as fever, runny nose, decreased appetite, and fussiness but within a couple days the child will then develop painful blisters. These blisters can be present only in the mouth, just on the body, or in both areas. The rash on the body is most typically around the outside of the mouth, by the hands including palms, on the feet and legs including soles of feet, and sometimes by buttocks. They start out looking like small red bumps and usually progress to a more fluid-filled blister. Treatment mainly involves pain management and keeping your child hydrated. There are no medicated creams necessary to treat the rash.